Monday 8th April 2019. Updated business for sale brochure available. Another financial year has come to a close and we have updated our business for sale brochure, which is available for download opposite. Although it might look at first glance that our turnover is down, this was entirely predictable due to our hours reducing from last January. However the important thing is our profitability increased by 9% over the previous year as we groomed pretty much the same amount of dogs in a shorter working week with a reduction in operating costs. So once again, we are able to keep our prices the same for a FOURTH consecutive year - although BREXIT may alter that if it ever happens! Tuesday 5th February 2019. 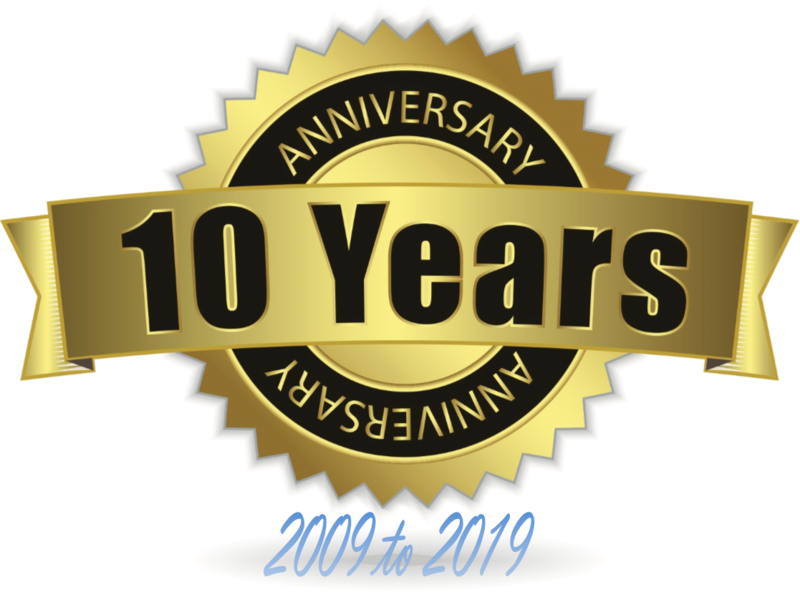 Happy Anniversary to us - SDG is 10 years old. Hard to believe, but we have been grooming since 2009! 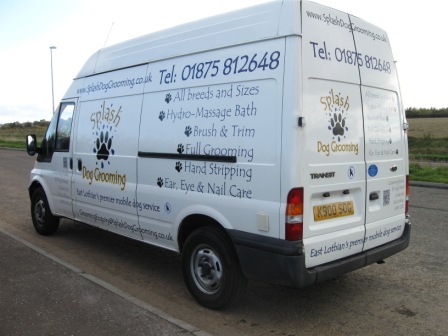 We first launched as a mobile service with a fully kitted out grooming van on 1st February 2009, and although we only did 8 dogs that month, we rapidly increased to 50 in April and 83 by October doing a 6 day working week. Our repeat rate was at 70% with new dogs accounting for 21% with the remainder being cancellations or no shows - yes even though we arrived at a customers house for a booked appointment, they weren't in! We then opened the Studio where we are now in October 2011 but only 6 of our customers wanted to stay mobile which was uneconomic so the van was sold in December to a start up groomer. Since starting in Feb 2009 we have groomed 12,049 dogs. We groom between 1,300 and 1,400 dogs per year. The most dogs groomed in a month was 148 in August 2017. Our second best month was 141 in May 2018. Actually more impressive, since we had reduced our working week to 3 days from the start of the year - almost twice the number of dogs in half the time from our mobile van days. 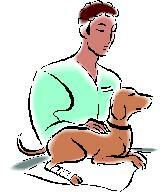 We have clipped the nails of 467 "walk in/no appointment" dogs since offering the service in April 2012. We currently have 1,599 clients with 1,824 dogs on our customer database. Since 2013, our bookings have consistently been made up by around 85% repeat customers and 10% new customers every year. The number 1 top breed is the Cocker Spaniel with 216. Next is the Westie (West Highland White Terrier) with 142. Our beloved Labradoodle breed is 12th with 46, Our Miniature Poodle is at number 32 with 11. Largest breeds we used to do: Newfoundland, St Bernard, Bernese Mountain Dog, Rottweiller, German Shepherd, Alaskan Malamute. Smallest breeds: Teacup Yorkshire Terrier, Chihuahua, Maltese. So, it's a big THANK YOU to all our customers past, present and future for helping us make this a successful business far beyond our original expectations. Tuesday 11th December 2018. Payment by Cheque. As the cheque guarantee scheme was scrapped by the Banking Industry in July 2011 and in line with most businesses, we will no longer be accepting payment by cheque from the 1st January 2019. The only payment methods accepted are by cash, debit and credit card. Friday 31st August 2018. Price Guide updated, but no increases. We have updated our price guide effective from tomorrow, 1st September 2018. There are no increases in any prices, only some minor changes to the text to make some items a bit clearer, sorting a couple of typos and adding prices to the maintenance groom example. On the reverse side, we have made our conditions clearer and added on the text that is currently on the customer record card that you sign/signed. This has been done from customer feedback to rectify a complaint that these conditions cannot be read in advance and could only be examined when in the studio, for example when attending for your first appointment and signing the card. This pulls all our conditions together on our price guide which is available to download on this site and in the box opposite. The same text is also on our Conditions page. Please take some time to read and understand these conditions, especially if your dog is presented with a matted coat or if it shows signs of aggression when being worked on, or barks a lot. Monday 21st May 2018. GDPR Consent and Policies. Unless you have been on holiday on another planet the past few weeks, you will be aware that the General Data Protection Regulation comes into force on Friday 25th May 2018. We have now completed the documentation, audits, forms, etc to make us compliant and the policies have been added to our Conditions page. We also need to explicitly get customers consent to contact them so please see the notice opposite. Tuesday 17th April 2018. Updated business for sale brochure available. Although it might look at first glance that our turnover is down, the slight drop was due entirely to the severe weather we all experienced in February which caused disruption to bookings, with only those very local able to attend appointments. Despite this, when you consider that we have reduced our working week by 4 hours from January this year by closing Fridays but staying open later on Tuesdays and Wednesdays, we are managing to do the same amount of bookings in our 3 day week that we used to do on the previous 3.7 day week! Which means that our turnover and profit levels are being maintained and the corresponding reduction in operating costs means we are able to keep our prices the same for a third consecutive year, which is a huge benefit to our loyal customers! Monday 18th December 2017. Updated price guide and Christmas holiday closure. Our price guide has been updated only to show our new opening times since we will no longer be open on Fridays from January 2018. However we will be open later on Tuesday and Wednesday and a few of our regular Friday customers have already changed to take advantage of these later appointments. We are full the week before Christmas and our next available appointments are Wed 3rd Jan onwards. We close for Christmas on Friday 22nd and re-open on Wednesday 3rd January. Friday 1st September 2017. What slow down? So much for slowing down towards an early retirement! We have just had our busiest month since Splash started way back in February 2009, with 155 bookings in August. Not surprisingly, this also equated to our highest ever takings in a month. This surpasses our last record month in May 2015 of 140 bookings. Monday 24th July 2017. Advance notice of Friday closing with effect from January 2018. As part of our previously announced retirement plans, we will no longer be open on a Friday with effect from January 2018. Our original plan was to do this in October 2016 but as we were about to change how our appointments were booked kept the Friday and made a couple of extra slots available by staying open 2 hours longer. The change had a big impact on Tuesday, Wednesday & Thursday booking availability, but oddly - not on Friday. So we are reverting to our original plan of being closing on a Friday but will be extending opening on Tuesday and Wednesday to 7pm closing, which will allow most regular Friday morning bookings to be accommodated by moving to early evenings instead. Thursday 1st December 2016. New price list with effect immediately. Please note that there is no change in price at the moment. The only changes on this price guide concern late cancellations and no shows, plus we are no longer able to accommodate extra large (and some large) dogs. Also, our later opening time on a Friday is now changed to 3pm from 1pm. Following on from the previous news post below: Far from slowing down or cutting back in preparation for retirement, we have been looking at how we can INCREASE appointment availability. We will be restructuring how we we schedule appointments from the 1st December. In addition, we have always had a high demand for Friday appointments, so will be extending our opening hours to 3pm from 1pm on a Friday. These changes will allow us to accommodate an extra 6 to 8 appointments per week, putting our availability up by around 25%. We are expecting these appointments to fill up quickly, so if you want one, get in touch soon - don't wait 'till the last minute to avoid disappointment. Do NOT try to book or check availability by email, message or text, You MUST phone for these days as they will fill up too fast to play media ping-pong. It's always quicker and easier to book with us by phone in any case. A year ago we made it known here, without advertising anywhere else, that we were ready to sell our business. We have had a few tentative enquiries, but nothing concrete in the way of a serious interested party. A problem mentioned by one quite recently was, there wasn't enough time left on the lease. Well, that has now changed as we have just renewed for another five years. So we have now updated our sales brochure (link on the left). For many of our existing customers that ask if we are retiring soon, "not yet", and the new lease gives us until September 2021 to hopefully find a suitable buyer. We have been inundated with calls for appointments over the past couple of weeks and as a consequence have very little space left up to the end of June. To compound matters, we are closed from the 29th June to the 5th July inclusive, so appointment availability is already pushing further out into July. WE WILL BE OPEN FOR APPOINTMENTS ON MONDAY 13th - now fully booked as of 7th June, 20th - now fully booked as of 9th June AND 27th - now fully booked as of 20th June - told you they'd fill up fast! OF JUNE 2016 ONLY. Do NOT try to book or check availability by email, message or text, You MUST phone for these days as they will fill up too fast to play media ping-pong. It's always quicker and easier to book with us by phone. Since we started way back in 2009, we have had a discretionary "two strikes and you are out" policy in our conditions in respect of missed appointments. However the increasing number of customers failing to turn up or calling in on the day, in some cases just several minutes before they were due in, to say they couldn't make it for a multitude of reasons we've head before has become unacceptable. We have been sending text and/or email reminders now for over 2 years but we have now revised this to sending them one week before and also the day before but despite this are still getting the odd NO SHOW. So it is with a degree of regret that we are now applying the condition rigorously to NO SHOW and LATE CANCELS alike, except for provable exceptional circumstances. The reasons for this are in the poster which is now displayed in prominent positions in the Studio and is in the link the the left. The recent sunshine must be the cause, as we have had two enquiries in as many weeks about renting table space from us. Five years ago when we announced that we had purchased and were about to start refurbishing the property that would become our Studio, we also made it known that we would be making up to three table spaces available for other groomers to rent from us. [The link is within the 5th May 2011 news item further down below, then scroll right to the bottom of the page] We never had any any interest noted so when the Studio opened in October 2011 we didn't bring that facility offer into the main site. However, we do have table spaces for rent and the information is in the box opposite. Please read the Information Sheet to understand the criteria for prospective renters, as we won't just allow anyone into our business environment, plus you must complete the Confidentiality Agreement before we will even let you in the door and discuss the matter further. On the other hand, once you show you meet the criteria and you are in, we are very relaxed about any form of commitment to using the facilities you might have - it's entirely up to you when and how often you want to use them. There is no contract to sign up to a minimum rental period and you can come and go as you please. Get in contact with us if this is something you would be interested in to progress your grooming business. Happy New Year to all our customers, and for those of you that normally block book for the year ahead and haven't done so yet, please feel free to use the Spreadsheet as usual and email it to us. You can either start a fresh one or update an existing one that you have sent before. Please note that our charges will be at current prices and not discounted like last year, as we are not planning any price increase this year. However, if that decision changes during the course of 2016, your prices will stay at the current rate. Just as we said in the last sentence on 2nd Nov, we have just completed a refresh of our IT infrastructure which means we are no longer using non supported Windows or Office software. So XP is gone and we are now running the latest Windows 10 with Office 2016 via an Office 365 business subscription - both of which are continuously kept up to date automatically including any future new versions. We have also outsourced our email which additionally means we can get mail anywhere on any device plus we have 1Tb of cloud storage for data backup. For the next owner of Splash, this major change and investment future proofs the IT infrastructure and gives full offsite backup for disaster recovery and is much easier to administer than our previous all in-house setup. Please see the links opposite for more details if you are interested in owning and operating the best dog grooming business in South East Scotland. We have put our business up for sale as a going concern as Mr Splash is able to fully retire a few years earlier due to the April 2015 pension changes. It’s no secret that Mr Splash has already taken early retirement (almost 6 years ago), hence our short working week. So we are simply bringing forward the existing plan that we started this business for. Being realistic, it can take many months or even years to sell a small business like ours, especially in a specialist market. A previous one took 11 years to sell! So we would like to assure customers that while it’s possible, it’s unlikely a sale for our business will be concluded in the short term, and that there will be no change to our service or bookings for the foreseeable future. Quite the opposite, we are still developing our services, equipment and growing the business to maintain our position as the best facility in East Lothian. Tuesday 30th December 2014. 2015 Advance Booking offer. Hopefully you will have noticed our price change notification on the website and on the posters in the Studio since the notification made last September, which is effective from 1st January 2015. Offer not to be missed: Download and complete our advanced booking spreadsheet and commit to booking with us for the coming year and the price you pay per appointment will be at the pre-increased price! Hurry, this offer expires on Friday 30th January 2015 and can even be applied to an existing January booking you may already have with us, but we MUST receive your completed spreadsheet (or a list of preferred dates and times by any method) back BEFORE you come for your appointment otherwise your appointment will be charged at the new price. Any advance booking spreadsheets received after the offer expiry date will be booked at the new prices. Please note that if you miss an appointment without giving at least 24 hours notice your prices for all following appointments will revert to the new pricing and if you miss two appointments the remaining bookings will be automatically cancelled. You can request a change of date and/or time of any appointment at any time up to 24 hours before it is due, but it will be subject to availability. This proved to be a successful promotion with just over 100 bookings made right up to Easter 2016, which equates to £500 of savings made by loyal customers. Friday 12th September 2014. Notice of price changes with effect from 1st January 2015. How many businesses do you know over the past 4 years that have not increased prices? In fact we actually adjusted some prices down in the last couple of years, but unfortunately due to the rising costs of consumables, tools, staff and utility charges we can no longer maintain our prices at the 2010 level. We are giving our customers an unprecedented 3 months notice from today that as of 1st January 2015, all published prices will increase by only £5 compared to the current price guide. We have been told by customers polled in recent weeks that we will still be exceptionally good value for the service we provide compared to others as it is just a modest increase. All our previous price guides are still available on our news page for comparison on the dates they were introduced, and we will still be maintaining our all inclusive "no hidden prices" policy. Please note that there is NO increase in the price for the no appointment drop in nail clipping service, pre-cutting, cancellation, minimum charge or clean up charges. Friday 21st August 2014. Hand Stripping service withdrawn. Unfortunately due to the repetitiveness of hand stripping increasingly causing aggravation to an old wrist injury sustained many years ago, I am no longer able to offer hand stripping as a service. 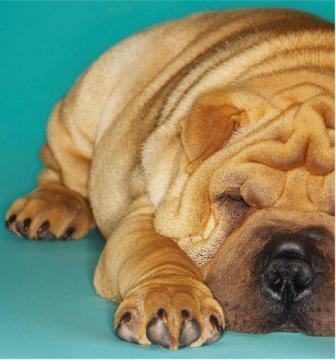 Many groomers who regularly hand strip eventually suffer the effects of arthritis or a repetitive strain injury. Although this form of grooming only makes up a very small percentage of the 1200 dogs that come to us I have noticed lately that the after effects of strain on my wrist are lasting for several hours longer than I used to experience. So to prevent further problems manifesting from the strain hand stripping causes, I have regrettably taken the decision to cease offering the service from immediate effect. Friday 25th July 2014. Persistent Barking. Please note that we have had to highlight in our conditions that we cannot accept for grooming dogs that persistently bark when being washed, dried or table worked. We have to consider and take seriously the disturbance that is caused to our neighbours by dogs who persistently bark as we are in a residential area with flats all around us. We may have to call you and ask you to collect your dog immediately in these cases and you have to accept that it may not be dry or groomed to your instruction. 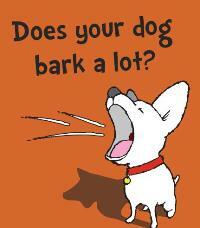 We also have to consider the Health and Safety issues of persistent barking on ourselves. It is a disturbance for our neighbours but it is a health hazard for us - we have recorded dogs barking here in our sound reduced bathing rooms which have been 106dB 3M outside the room. It's not good for our neighbours and it's not good for us, so please be understanding and don't be upset or offended with us if we say we cannot have your dog back with us again. Tuesday 22nd July 2014. Text appointment reminders. After upgrading our booking software last week we are now able to send out text reminders to customers as well as emails of their next appointment a few days before. Often customers simply forget their appointment or go on a last minute holiday and not cancel the appointment they have with us. It may be a minor inconvenience to customers to have to rebook again (currently 3 to 4 weeks lead time) but for us is a wasted appointment if a "no show" as we give up to 15 minutes for late arrivals and by then is usually too late to get it filled by another waiting for a cancellation as the total delay would throw out the schedule for the rest of the day. Not getting notice of the appointment being no longer being required also means that we could not offer it to someone else so a missed appointment is a "double whammy". As we have many more mobile numbers for customers than email addresses, the new text reminder service should in theory cut down the vast majority of no shows due to forgetting the appointment, plus we can track that it has been delivered as well so the old excuse of "I forgot" should be a thing of the past! Wednesday 7th August 2013. 1,000'th doggy customer. We only just realised that at the end of last week we booked in our 1,000th new customer into our booking database. This means that in under two years since we opened the Studio, our customer base has grown by almost 70%! Tuesday 9th July 2013. Paw Imprints now available. We are now stocking Potty Emma Paw Imprint kits. Give yourself a lasting memory of your puppy's paw prints preserved in clay and framed for only £35. Have this done prior to your dog being groomed at an appointment or just drop in and have it done. Wednesday 12th June 2013. Change to Friday Appointments Availability from July 2013. As you will appreciate, dog grooming is a messy business and we are constantly cleaning with a full clean up at the end of the week. This generally means a 9pm finish on a Friday which we are no longer able to do with other weekend commitments. From July 2013 we will no longer be accepting appointments on a Friday which would finish later than 1pm to allow us to carry out our weekly deep clean on a Friday afternoon. We apologise for the inconvenience this will cause some of our customers. Saturday 25th May 2013. Pipe Band Sponsorship. We are proud to help sponsor the formation of a Juvenile Band within Cockenzie and Port Seton RBL Pipes and Drums by providing them with a new Bass Drum. The larger drums the band has are much to big and heavy for the smaller members to use and carry. With the addition of the smaller one, everyone now wants to be a Bass Drummer! Well done to Connor on his first time out with the band at Penicuik Gala. 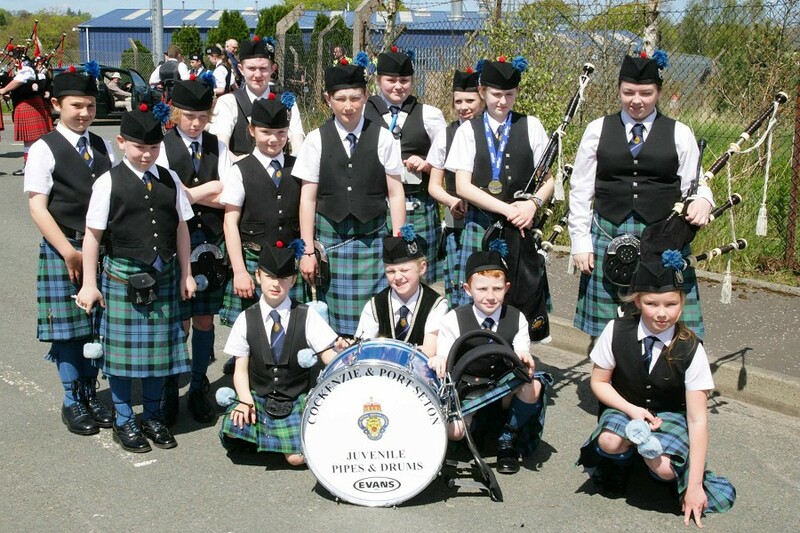 Watch out for the Juvenile band at Port Seton Gala on the 8th June as they are taking part with the main band, but are also taking on some playing roles as their own band as well during the parade and escorting the new Gala Queen. Click on the photo to go to the band's web site for more info or to book them for a function. 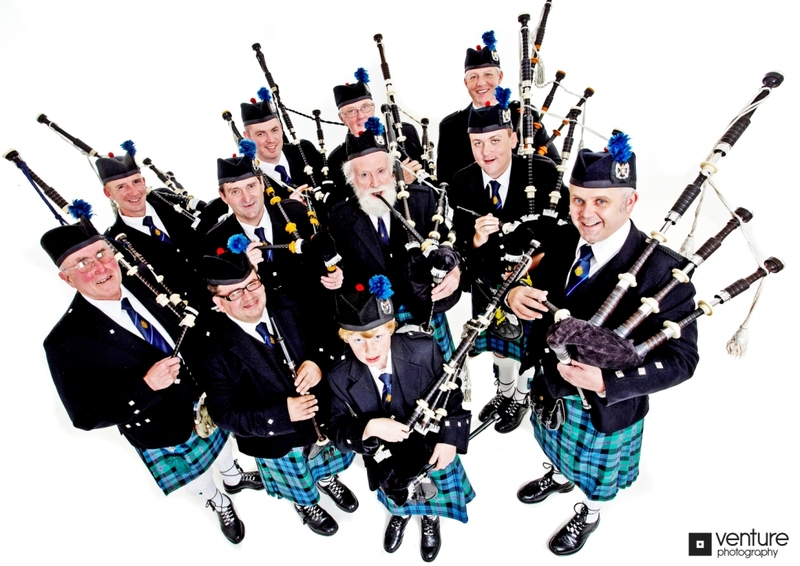 They can provide pipers, mini bands, juvenile band or the full band. Any size to suit your budget. A printable PDF of our price guide is available by clicking this text. Wednesday 22nd November 2012. New Guide Price list for 2013 now available. Following on from the earlier news items in May and October this year in relation to the change in services and opening times, we have revised our Guide Price List which takes effect from 1st January 2013. This is now available in advance of the changes just so everyone knows about them as soon as possible. The look of it has been revised to make it easy for new customers to find us and get all our essential contact details on your smart phone. Click on the link opposite to get your printable copy. All prices stay the same except for one lowered price (the starting price for extra large dogs). We've expanded, renamed and re-banded the example breeds/sizes to make pricing a bit clearer. As always, prices are a guide as actual costs for a particular dog are dependant on many factors on presentation for grooming - size, coat density/condition, desired/achievable end result, work/appointment time needed, temperament, etc. The other changes are the change in opening hours now being Tuesday to Friday (closed Saturday, Sunday & Monday), The DIY facility closing plus we are also ceasing collect and returns. As well as making the price guide available in advance, we've also updated the website pages in advance as we only have two remaining Saturdays left that we are open in December and they are both fully booked. The DIY is still open up to Christmas. The pricing and the conditions of use can still be found on the price guide downloadable below in the 26th March news item, as well as in the Studio when visiting. Tuesday 20th November 2012. Christmas Craft Fair. 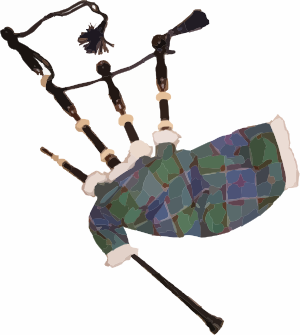 Come along to Cockenzie & Port Seton British Legion on Sunday 25th November between 12pm to 3pm and support the local community Pipe Band. We have a table there too with some of our doggy retail goods for sale as well as advent calendars for dogs (and cats too), so pop along and see us as well as the other exhibiters stalls. There's loads of interesting stuff to see and buy plus a raffle, cup cake decorating and tattoo's for the kids, tombola, tea, coffee and home made cakes - plus a few tunes from the band as well! Monday 1st October 2012. Advance notification of opening hours changing and the DIY facility closing. From January 2013 we will no longer open on a Saturday plus our DIY facility will close. We have been closing two Saturdays a month since July and will be extending this to every Saturday, so we will only be open from Tuesday to Friday from 1st January 2013. Opening longer on a Thursday to compensate for the very few customers we have that can only come to us on a Saturday is under consideration, but only if there is sufficient demand for it. Following the staff expansion last month and the increased appointment capacity as a result, we are needing to replace our smaller fixed height bath with a larger electric lift bath to alleviate the problem of larger dogs being booked for the same or overlapping appointment slots. Unfortunately, the DIY service has not been used as much as we had first hoped. Unless there is a dramatic and sustained increase in demand by Christmas, we can make better use of the existing DIY bath by moving it through the back instead of buying another new one. Tuesday 28th August 2012. Service Enhanced. Following the successful completion of Pet Care Trade Association run courses yesterday and today, we now have three Animal First Aiders as well as three Certificates of Competence in Microchipping. Please note that although being animal first aiders, we are unable to diagnose illness or dispense medicines, so veterinary advice should be sought for your dog's ailments. It looks highly likely that legislation will be introduced soon requiring ALL dogs to be identifiable by being microchipped, regardless of age or breed type. This will supplement the existing Control of Dogs Order 1992, which requires all dogs in public places to have a collar with a tag identifying the owner by name and address with a contact phone number being optional, but advised to be included. Monday 20th August 2012. SDG is growing again. Other groomers in East Lothian may have recently given up for whatever reason, but we just keep growing and gaining ever more new customers. Since we opened the Studio last October we have seen a steady rise in our customer base at the rate of around 10 a week and the demand for our service is now starting to push out our first available appointment date further and further into the future again. It has only taken 10 months to fill the increased capacity of the Studio compared to when we were just a mobile service, and by the end of August we'll have almost doubled our customer base to 750 dogs from 400 last year! We currently groom between 120 and 150 dogs per month compared to around 80 to 100 when we were mobile. We have had assistance one day a week for the past few months from friend/customer and fellow Poodle owner Gillian, and we are delighted to announce that she will be joining us full time as a trainee groomer in September. It will take about a year for her to get fully trained up to our standards but we should start to see an increase in our appointment availability again within two or three months as Gill gets more involved in all aspects of our business and completes her initial training. Monday 21st May 2012. Change to opening hours & holiday dates. From July 2012 we will not be open on the 2nd and 4th Saturday of each month in addition to our normal Sunday and Monday "weekend" closure. To confirm, the extra dates we will now be closed until the end of the year are: 14th & 28th July, 11th & 25th August, 8th & 22nd September, 13th & 27th October, 10th & 24th November, 8th & 22nd December. A few of these dates already overlap with scheduled school holidays when we are already closed between the 7th to 16th July, the 13th to 22nd October and the 22nd December to the 2nd January 2013. Monday 26th March 2012. New Guide Price list. We hope you will be pleasantly surprised in these austere times, that even though we have not had a major price review for over two years and invested a huge amount in our service, we have been able to REDUCE some of our prices to reflect what we have actually been charging these past few months! Our new revised price guide effective from April 2012 is available to download opposite. As a quick summary, we have lowered the published prices for small and medium dogs, increased the starting price for hand stripped dogs, introduced an additional charge for dogs that require pre-clipping prior to bathing to remove excess or matted coat plus a charge for non-grooming customers nail clipping as notified earlier this month. We have dispensed with maintenance grooming prices as the vast majority of dogs are booked in for a full groom. We do have some dogs on ongoing maintenance programmes, an example is now included on the Maintenance Groom page. Our customer records have now all been entered into our booking software. Please be patient when you next come for an appointment so we can verify your details are correct. Our glamorous receptionist may also call to confirm details if you are not due in/haven't been in for a while. Once we have corrected any typo's and checked we have your current mobile number and email address we will be able to automatically issue appointment reminders by text and/or email if. We already know that some don't have email addresses or simply don't wish to give them out. We understand fully that there is enough junk email out there, but we can assure you that we will ONLY use it for reminders if you wish to give it to us. We don't have emailed newsletters, but even if we did you would have to opt-in as the software has this feature set to opt-out by default. A printable PDF of our nail clipping guide is available by clicking this text. Monday 12th March 2012. Free nail clipping. We have been carrying out free nail clipping for a number of months without appointment - just drop in and if we have the time and your dog is compliant to the process we would do it for free! Not surprisingly word has been getting around about this and since vets charge around £11 to £15 for this, we are constantly getting asked to perform this task which is becoming quite disruptive to our appointment schedule. So from April 2012 we will only be continuing this as a free service for existing grooming customers and a nominal charge of £5 for non-grooming customers will be introduced. We have a hand out on nail clipping which you may find interesting which is available to download opposite. Friday 17th February 2012. DIY SHOW PREPARATION. Our conditions and price guide have been updated with information on the use of the DIY Room equipment and facilities. You can download and print a copy from either of the Grooming Pages. Monday 6th February 2012. DIY SHOW PREPARATION. Are you attending any dog shows in the area, such as the Scottish Kennel Club Show on the 18th to 21st May? 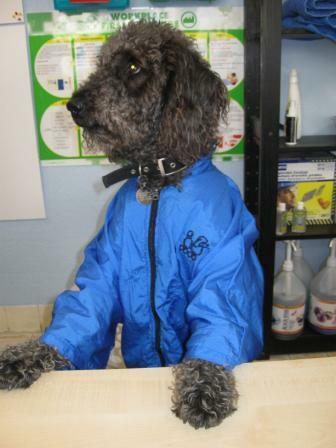 Why not book to use our DIY Booth to get your dogs coat in prime condition immediately before exhibiting? If there is enough demand we might stay open late on the evenings before the shows and allow all of our facilities to be available in addition to the DIY Booth. As you would expect from a professional studio, we have fixed and electric lift baths all fitted with our own water efficient proprietary designed and manufactured "Splash Shower" recirculating hydrobath units which have 4 shower head settings for gentle and deep cleaning of any coat type, fixed and electric lift grooming tables, blasters and dryers as well as a large range of Kelco concentrated professional shampoos and conditioners - or you could use your own. Please ensure to give us a call well in advance to book a time and ensure we can fit you in. Tuesday 31st January 2012. The DIY Booth is now fully open and has already been used by a Bernese Mountain Dog, a German Shepherd and a Rottweiler! Thursday 26th January 2012. THE DIY BOOTH IS NEARLY READY FOLKS! The shower units are all built and plumbed with the electrical control boxes for the pumps scheduled for completion this weekend. So all being well, the facility should be available for use from Tuesday 31st January. Thursday 4th January 2012. A Happy New Year to all our present and future customers. This is our first day back since closing on Christmas Eve and we are raring to go! It's not been all merry making and relaxing though, as we spent the last couple of days pressing on with the manufacture of our two remaining "Splash Shower" units, so the DIY booth should finally be up and running very soon! We have had lots of interest in this since opening in October and with pretty much everything else all done and working how we want, it is our top priority to get this operational ASAP, so keep checking back here for the opening date this month. Friday 2nd December 2011. Although we had intended to close our mobile service at Christmas, today was our very last mobile grooming day ever, as we have now sold our van to a new start up groomer based in the Dunbar area. We wish Julie Melville, who also trained at Scotgroom, all the best in her new venture and hope she has as much good fortune as a mobile groomer as we had. We have updated our price list and conditions to remove the mobile service, which can be downloaded from the link on the left. Sunday 27th November 2011. We are finally making some progress on getting our DIY and remaining grooming room baths operational, with the mechanics of the shower units almost built, and the electric control boxes to follow. We have just about completed the installation and setup of our computer systems so will hopefully have entered in all our customers details into the booking software by the end of January. Friday 25th November 2011. Looks like we will be ceasing even earlier than Christmas as we have a buyer for our van which will probably be leaving us in the first week of December! This means our very last mobile van service day will be the 2nd December 2011. Customers with mobile appointments after this date will automatically have them transferred to Studio appointments for the same date and time. We will call or write to confirm that this is suitable or if a different date would be more convenient if you are able to change to the Studio. This change of service will also mean our opening hours at the Studio will be changing, so we will be open all day on a Friday and it won't just be for DIY. Thursday 17th November 2011. To make payments easier for our customers, we are now able to take debit/credit card payments in addition to cash and cheques. Monday 31st October 2011. We will be ceasing our mobile grooming van service permanently from Christmas 2011 and will be putting the van up for sale. As most of our customers have been made aware over the past four months whilst we were refurbishing the Studio that our mobile service would be reduced once we opened. Initially, we thought that we would have to operate it in 8 locations with a couple of those sometimes needing 2 days a week. As we got nearer to opening the Studio, it was apparent that we would only need to operate in 5 locations one day a week, but to make that worthwhile we would need to have between 6 and 8 dogs booked plus extend the mobile grooming day by one hour. We even removed the generator and added a new 210 litre water tank so we could cope with more dogs as we only had enough to do 6 with the original built in 140 litre tank. However, of the mobile days allocated since the Studio opened to the end of this year, the majority are only booked to around half capacity or less. Over the last two Fridays, we had only 1 booked and 2 booked respectively. In the run up to the Studio opening, we had a 95% customer conversion rate changing from the mobile service. Since opening that has increased to 98% and we simply don't have enough bookings on the mobile days to even cover the costs of keeping it going. The rate of change over has far outstripped our expectations, plus having increased capacity at the Studio we've been able to cater for every single new customer enquiry for a booking within a few weeks instead of a few months. That is a huge difference for us as we used to lose around 3 new bookings every day as we could only fit in around 10 new customers a month because of all our advance bookings. This increase in new customer take up has compounded our decision to cease the mobile service. From opening the Studio just a few weeks ago, we have been able to take on and service twice as many new customers than we have existing mobile bookings over the next 6 months. It is unfortunate and regrettable as we know that for those few mobile customers we still have, it will be a great inconvenience to them to lose this service. If there are any groomers out there reading this and would like to own, what is probably the best set up K9 converted grooming van in the country, please contact us. We have incorporated dozens of modifications and improvements over the last three years to the standard K9 conversion so you can maximise your throughput and earnings. With the additional 210 litre water tank, you have up to 350 litres or hot water available, so you could even just use the van as a static salon at your house without going mobile at all, cutting out all the travelling time plus keeping all the mess contained in the van and out of your house or garage! There is heating for the winter and air conditioning for the summer plus loads and loads of other improvements. 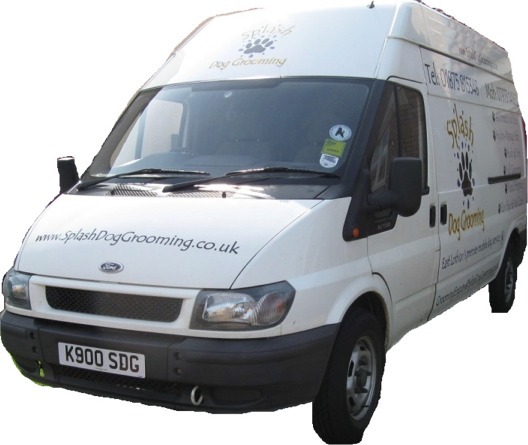 We have successfully assisted other groomers start up their mobile service from scratch based on what we have done with ours, so can help you with your mobile grooming business too! UPDATE 4TH OCT 2011 - OUR NEW STUDIO IS NOW OPEN! Thursday 5th May 2011. For the people of East Lothian, the Scottish Parliament election on May 5th may be regarded as a historic, land mark event in Scottish history. 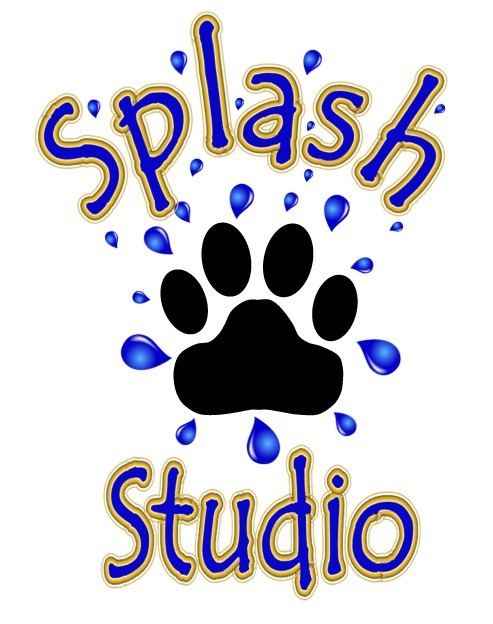 But what has got the dogs of East Lothian excited is the news that on the very same day, Splash Dog Grooming added a Studio premises to it's service portfolio in Cockenzie High Street! We have moved the news item that was originally posted here to a dedicated Grooming Studio News page created to keep our customers up to date with developments. Saturday 2nd April 2011. That's the end of another trading year for us, and what a year it's been. For those of you who like numbers, here's some stats on us for 2010/11. Total dogs groomed: 1041, average customer repeat rate: 82%, new customers added: 187, total customer dogs: 550, average dogs groomed per month: 87, highest months: July 2010 (106 dogs) and March 2011 (103 dogs), most groomed dogs in a day: 8, average fully booked days ahead to a free appointment: 49 days, furthest ahead a customer wanted to repeat book: 3 years! For those of you that have had difficulty in getting appointments, we hope to be making an important announcement very soon that will allow us to more than double our capacity - keep checking back. Download our Excel Spreadsheet here to help you easily work out advance bookings which you can then email to us. Sunday 16th January 2011. We have now caught up will all the postponed bookings due to Decembers snow and are taking lots of advance repeat bookings again for this year. We are currently full to early March, and it is about 3/4 full as of today. To make it easy for everyone to work out an advance repeat booking schedule, we've created an Excel spreadsheet that does all the calculations for you which you can then email to us. See opposite. Christmas Eve 2010. Phew, what a month December turned out to be! We are now finished and taking a short break before getting back to business on the 5th January 2011. Thanks to everyone who made 2010 an incredible year for us. We have increased our customer base by almost 45% since April. Keep looking here for an important announcement we hope to make in the next 3 or 4 months which will allow us to accommodate even more customers and reduce our booking timescales by increasing our capacity to serve your doggy needs! Have a very merry festive break and here's to a great 2011 for all! Tuesday 21st December 2010. We have managed to reduce our backlog from around 20 to 5 dogs over the past week by extending the working day and using our normal days off, but the extreme cold overnight is now causing problems with the Hydrobath water pump and delivery pipe work as well as the bath drain, which takes time to rectify each morning causing some disruption to the first bookings of the day. There are still some difficulties with the current spate of snow and ice which have caused us to revert to collect and returns again for some customers. 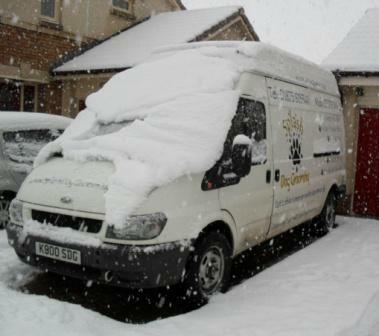 With more snow forecast for our area tomorrow we are expecting it to become more difficult to operate our service. We thank customers for being so understanding at this busy time. Monday 13th December 2010. Thankfully the thaw over the past few days has allowed us to catch up on a few of the cancelled appointments from the last two weeks but we still have 15 dogs needing rescheduled somehow. The concern is the next weather front closing in from the North on Thursday through the weekend will bring more cancellations instead of allowing us to catch up some more on Sunday and Monday. We'll just have to see what happens an hope it's not a repeat of the last two weeks! If it is though, we will just have to offer collect/returns again as below. Monday 6th December 2010. As you all will have experienced, today's snow fall is exceeding predictions and was reckoned to have stopped by 11:30am but is still falling mid-afternoon. That's another 4cm today so far. At least the kids got out the house to school, but it looks like that may not happen tomorrow and add to the disruption again. Whilst we managed to get to one appointment on Saturday, the van got stuck trying to get to the second and then again getting back home. So as we can't safely get parked up in residential areas and ensure we can get moving again afterwards, we will only be able to groom dogs for the foreseeable future that can be brought to us or if we can get to you for a collect/return in the Freelander, but only if you are within about 3 miles radius of us. 1st & 2nd December 2010. All appointments cancelled today except those that live nearby that can bring their dogs to us. Our street hasn't been cleared and although we "might" be able to get the van out, we wouldn't be able to get it back in as the snow is about a foot deep either side with only a single track up the middle, so we could end up blocking the road trying to get it in or out. We couldn't even get to one location yesterday with the Freelander as the road was blocked with stuck vehicles at either end. From calling around over the last couple of days it's pretty much the same situation everywhere else. What we will do once things start to get back to "normal", is use our Sunday/Monday days off and early evenings to catch up with the backlog. 30th November 2010. All appointments were cancelled today unfortunately, and the chance of getting the van out and back in again here is pretty much zero. However, the windscreen depot in Bilston was back open today and they were able to replace the Freelander's cracked windscreen - Hooray! So although we unlikely to get out with the van over the next day or so, we will be able to offer a free collect/return for dogs in the towns in our immediate vicinity as an alternative. So if you are in Port Seton, Cockenzie, Prestonpans, Tranent, Longniddry or Macmerry you are in luck, but travelling further than that won't allow enough time between grooms - sorry. So if you are not in any of these towns, we will have to try and reschedule as best we can once things get back to normal. 29th November 2010 - Severe weather notice. It is highly likely that appointments are going to get disrupted over the next few days or even weeks as we currently have 17cm of snow and it's still falling. The problem isn't so much getting around on the main roads, but getting safely parked up and being able to pull away again from the roadside. We can't even offer a collect and return service in our Land Rover Freelander like we did in January, as it suffered a stone chip on Saturday which has now developed into a huge crack in the windscreen. Not surprisingly we we can't get it replaced due to the weather! We managed to assist re-homing Dixie in May this year but it was only temporary as the children were so upset at her leaving. However, there is a serious illness in the family and it is just not possible for them to keep her now, so we are trying to re-home her again as soon as possible. Dixie is a 3 year old Tibetan Terrier/Spaniel cross. She has no medical problems, fully vaccinated, is very good natured and loves a good long walk. She is very good with children, is house trained and doesn't chew up anything. November: Dixie has been re-homed in Fife with a relation of the family. Our holiday cottage in Jedburgh is now available for booking via our other website at www.CaledoniaCottages.co.uk. It has been refurbished by us over the past three months specifically to be dog and child friendly. So if you are looking for a "staycation" not too far from home, why not have a look at what is offer in the area. The cottage sleeps up to 8 and we have offers for Hallow'een and all of November. As of today, with the exception of possible cancellations becoming available, we are now FULLY BOOKED for this year. As a consequence, many of our repeat customers are already booking in advance to the end of 2011 to ensure they get their appointments allocated and their dogs regularly maintained. One of the easiest ways to book in advance is to email us your preferred dates or days which are/aren't suitable, stating whether mornings or afternoons are best. Just let us know your name, address and a contact phone number plus brief details of your dog(s) and your preferred cut or style - same length all over, short but not too short, with/without feathers/skirt or whatever. We will do our best to allocate what you want, or suggest alternatives where we may already be fully booked or let us work out a schedule for you. We are here to help, just let us know your requirements. Our pet friendly holiday cottage in the Scottish Borders is almost finished being refurbished and will be available to let from early September. Located in Jedburgh with commanding views over the scenic Borders countryside, it is fully equipped with all the modern comforts of home you could wish for and is only an hour from Edinburgh and the Lothians. With many holiday companies going bust this year plus strikes at airlines and airports leaving thousands stranded, why put up with the uncertainty and cost of foreign travel when there is so much to see and do almost on your own doorstep - and even better, you can take your dog with you! 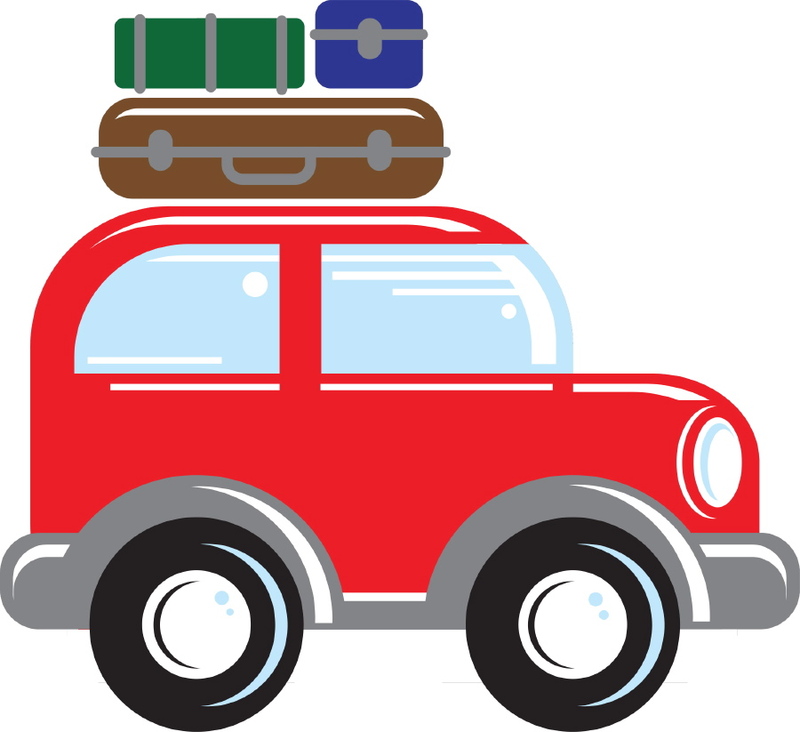 Please see our other website www.CaledoniaCottages.co.uk for more information. It's official - the SDG grooming van is the COOLEST way to get your dog groomed, thanks to our newly installed air conditioning unit. Summer is here and it's fair to say that it can get incredibly hot in the van when the sun does grace our normally grey Scottish sky and the dryer is pumping out high velocity hot air. Being a hot dog or a hot groomer is not comfortable, but now we can all stay cool and get the job done with less stress when the temperature is on the up. Dixie is a 2 year old Tibetan Terrier/Spaniel cross and his owner in Tranent would like to re-home her. She has no medical problems and is very good natured, but needs more walking than his busy owner can give her. She is very good with children, is house trained and doesn't chew up anything. Update 4th May 2010: Another success, we have found Dixie a new home with one of our relatives. Lots of space to burn of all that energy on a farm and will still be one of our customers. We have now split the News & Links page into separate pages, and added a grooming tips section with the links. New guideline price lists come into effect from today, but please note that all bookings made in advance during the last quarter remain at the old prices with an additional 10% discount. All new bookings made from today are subject to the new pricing guides on the maintenance & full groom pages. A big THANK YOU to all our customers new and old. We have just finished our first full trading year and what a year it has been. We have groomed 800 dogs since last April and have an average 51% repeat customer bookings per month, peaking last month at 72%. We are also fully booked almost seven weeks ahead and are around 20% advance booked right through to January 2011. We currently have over 450 doggy customers and add around 30 new ones every month. 97% of all customers with appointments in February and March booked in advance right through to the end of the year. These customers took advantage of our new year discount offers and gained an additional 10% off the standard price whilst protecting the cost of their grooming against our planned April price increase. Our interview will be a live broadcast between 10:50 and 11:30am on Thursday the 18th March. If anyone listens, let us know what you think of it on our Buzz page! Update 18th March 2010: If you missed it, here's an edited, music free copy - click here and open it in your media player. It would be fantastic if a caring home can be found for Ben, a nine year old Miniature Poodle. One of his owners passed away last autumn and his remaining elderly owner doesn't feel able to give him the exercise and attention he needs. He is a long standing regular customer of ours and has a calm temperament. He's in excellent health with no medical problems. Update 10th March 2010: Ben has been re-homed and we are delighted that it is with another of our customers who already has a white Toy Poodle. As a special 'thank you' for taking him in, we have offered to groom Ben (now Bo) for half price for the rest of 2010. You can now follow us on East Lothian's very own social networking site "East Lothian Buzz". 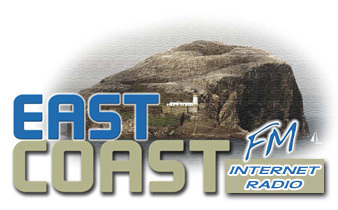 We will be giving an interview on East Coast FM sometime in March and we'll let you know when. Click on the logo to see what the Buzz is all about. There is a link to ECFM by clicking the Radio tab. Brrr, it's snowy, icy, and as cold as the arctic causing other groomers salons to close or prevent you from taking your dog to a salon, but we are still managing to complete 80% of our appointments! So long as we can get to you, park safely and ensure we can get moving again afterwards, we can groom your dog when others can't. If we can't make it with the van, rather than cancelling or postponing the appointment, we may be able to collect and return your dog if time allows with our 4x4 Freelander for a small extra charge. Just some more reasons why we are East Lothian's premier mobile dog service. Merry Christmas and a Happy New Year! - not one, but THREE new recession busting offers to start off 2010! one: It's back! the puppy discount is now bigger and better than when we first introduced it in April 2009. To encourage puppy owners to have their dogs introduced to professional grooming, we are offering a massive 50% discount on all appointments taken by the 31st March 2010. Puppies must be under 9 months old on the appointment date to qualify and must have had their second vaccination. two: As advertised in "The East Lothian Courier" 17th December 2009. Receive a £5 discount per dog up to a maximum of four dogs for all appointments taken between January and the 31st March 2010. This offer cannot be used in conjunction with the puppy discount above or any other multi-dog appointment discounts. Multi-dog households do not need to have all dogs booked to be groomed at the same appointment. three: Book in advance for the whole year from January to the end of March to receive a 10% discount off every appointment from April to the end of December 2010. The more regular appointments you make, the more you save - plus the earlier you make them, the more often you can take advantage of the other two offers until the end of March as well! We have decided that showing is not for us and Roco's last show was today at the Border Union Agricultural Society Championship show in Kelso. However, he has gone out in style with a Very Highly Commended in the puppy class and a first in the Junior class. Perhaps we will have a try at agility with Roco once he is a bit older. No doubt he will be able to run even faster without his show coat as he has no problem keeping up with Rio just now! We were unavoidably delayed in getting to the Scottish Kennel Club Show last week and arrived just as Roco's classes were finishing. However, congratulations go to Roco's breeder Fiona Swan, as his brother Reily (Lochnevis Milan) won the Puppy class at the SKC show and is now qualified for Crufts. His sister Eboni (Lochnevis Playgurl) was first in the Limit class too. We did have some measure of success, as we groomed two Tibetan Terriers the day before which came all the way up from Tamworth near Birmingham and they achieved a first and third - well done Wendy McCormack. On the spur of the moment today we went to the Companion & Pedigree dog show at Archerfield (between Gullane and Dirleton). Rio was second in the novelty "dog with the waggiest tail" class and Roco was first in the open pedigree puppy class. After no placement at his first show in Perth a couple of weeks ago on his 6 month 'birthday', Roco came good at a drizzly and windy Kirkcaldy show today. Granted there wasn't a lot in the way of competition, but he still achieved best puppy in breed plus a 2nd in the open Miniature Poodle class, plus 3rd and 4th Reserve in the Utility Minor and Puppy classes as well. Our membership has been approved for the 'British Dog Groomers Association' which is operated by the Pet Care Trust. For our customers, this means that we promise to abide by the BDGA's Professional Groomers' Charter, a code of practice designed to guarantee the highest standards of customer care and animal welfare. Become a fan of Splash Dog Grooming on Facebook®. Click the logo on the left to go to our wall. Speak to any dog trainer and they will tell you that the quicker a puppy is socialised and given basic training the happier it is, plus the owner is more relaxed and confident with it. Grooming is a vitally important part of socialisation as it gets the puppy used to being handled by a stranger as well as having its eyes, ears, paws, nails and coat maintained in good order. Introducing a puppy to grooming by a professional and being handled frequently by it's owner, friends and family helps enormously in alleviating the potential for nervous and aggressive behaviour as it is developing and growing compared to dogs which have not been regularly groomed. Please see more on our philosophy on puppy grooming on our 'About Us' page. A photo gallery page has now been added to the site with a link added to the menu at the top of the pages. Click to select one of the albums that are rotating round when it is nearest you. Select whether you want to view as a book or a slide show from the icons above it or go back to select a different one. When selected as a book, you can flick back and forwards through it (top and bottom left/right page corners) with your mouse. Alternatively, click and drag the pages over with your mouse. What a week it's been for Roco. He passed his puppy training test last week at Posh Pets Obedience Training and won Best Baby Puppy at the monthly Broxburn & District Ringcraft Club match last night. We realise that even though a mobile service is very convenient, there are times when it may be even more convenient to have your dog collected and/or returned to your home or even your place of work. By customer request, we have now introduced a limited collect and return service. Please see the grooming pages for more information and costs. Come and see us at Dunedin Vets open day on Sunday 1st March between 11am and 2pm at the Tranent practice. They are celebrating their 15th anniversary and we have provided two free minimum groom vouchers for the raffle. Further details are on the open day on the Dunedin Vets website via the links section below. 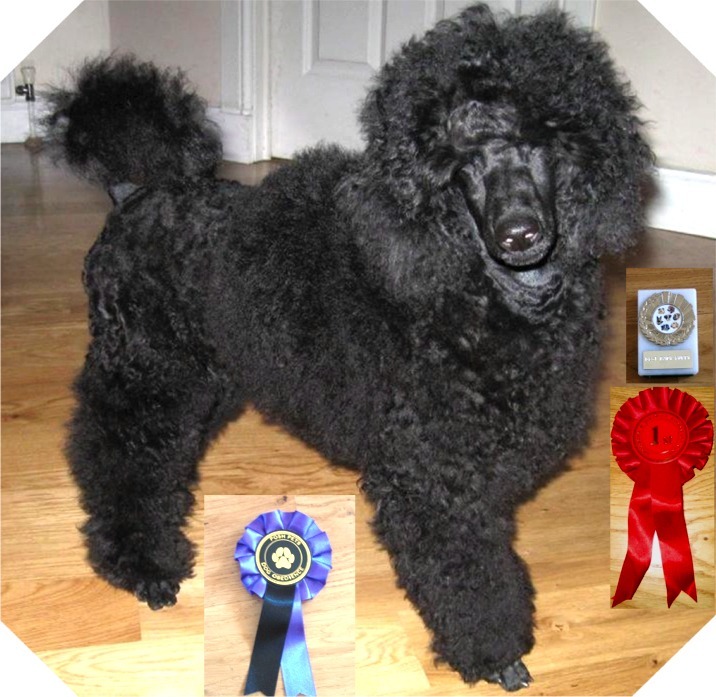 Our black Miniature Poodle called Roco (Lochnevis Tokyo) has been entered for his first shows. We have never shown dogs before and are just doing it for a bit of fun, but with 20 champions in his five generation pedigree we are hoping that he will manage some good results despite our lack of experience! 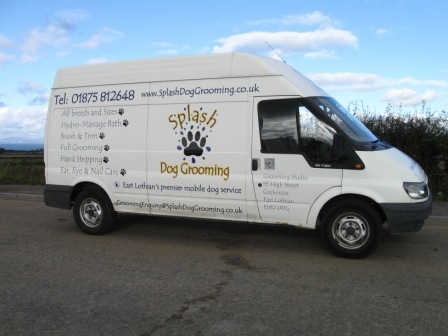 Splash Dog Grooming's Mobile service launches to serve the grrr-ooming needs of East Lothian's pooches with a specially converted and professionally equipped van. We can supply hand grooming equipment and show you how to use it so you can keep your dogs coat mat free between grooms. We also stock a range of accessories, dog toys and shampoos. Support our local community pipe band. Click on the text above for more information.